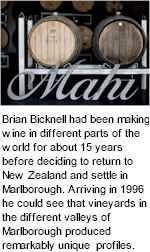 Brian Bicknell had been making wine in different parts of the world for about 15 years before deciding to return to New Zealand and settle in Marlborough. Arriving in 1996 he could see that vineyards in the different valleys of Marlborough produced remarkably unique profiles. 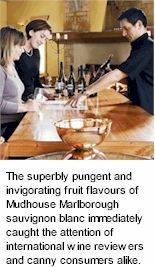 At the time, most of Marlborough�s wines were made as regional blends with many individual site characteristics being lost. In other areas of the world distinctive sites were being celebrated and so an idea was hatched to create a label that promoted different vineyard sites across Marlborough to show the region had true depth and complexity. Wine reflects both the place and the people involved, you can have a great site, but if the management is poor, or the owners too greedy, then this will be reflected in the fruit and the wines. The property on which Majella now stands was originally owned by Frank Lynn, and bought by his nephew, George, in 1960. George and Pat Lynn kept Merinos for wool production on their farm about ten miles away, and had always wanted some good Coonawarra country for their up-and-coming prime lamb enterprise. 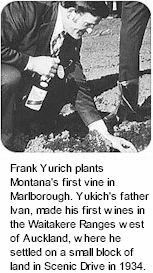 Viticulture, however, was not on their agenda until 1968. 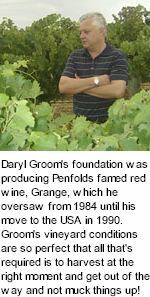 Daryl Groom was Penfolds Senior Winemaker where he oversaw the making of the mighty Grange. Groom Cellars is the culmination of a dream, backed up by many years of talk and family discussion. The proprietors are David & Jeanette Marschall and their six children, and Daryl & Lisa Groom and their four children. The dream started to become reality with the purchase of 87 acres of bare land in the Kalimna appellation of the Barossa Valley, directly adjacent to the renowned Penfolds Kalimna vineyard - the home of Grange. In 1997 the first acres on their Kalimna Bush Block were planted to Shiraz, producing its first crop in the 1999 vintage. 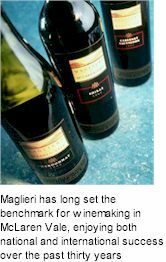 To compliment the young Shiraz fruit, Marschall Groom source from one other very reputable high quality site in the Barossa, the Fechner Vineyard which is home to 50 year-old vines. Massoni's passion for fine wine was influenced by his family’s involvement in establishing such culinary icons as Melbourne’s Florentino Restaurant in 1928 and through his relationship with his uncle, master winemaker Jimmy Watson. Over the years, Massoni have focused on making wines that enthusiasts would choose to enjoy with their family and friends. 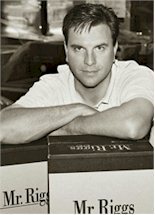 In 1990, Ian Home, founder of Yellowglen, became a partner in the business and introduced Pinot Noir and Lectus sparkling wine to the product range. 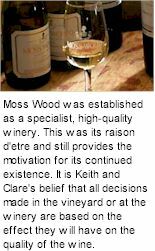 In 1996 Ian visualised the need to expand the company’s source of ultra premium grapes beyond the Mornington Peninsula, whose erratic meso climate and limitation in supplying quality chardonnay and pinot noir restricted the product range Massoni was able to offer. Back in the early 70’s, the vision of Matua Valley’s founders Ross and Bill Spence was to revolutionise the still fledgling New Zealand wine industry, taking advantage of unique regional qualities to create innovative and distinguished wines – the kind they wanted to drink themselves. They succeeded, beyond their wildest dreams. 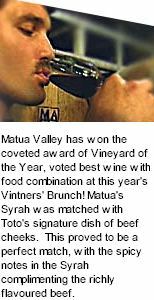 Today, Matua Valley wines are acclaimed and highly sought after throughout the world. The 100 hectare estate surrounds the historic homestead on the Icely Road leading to where gold was first discovered in Australia in 1851. The original school house on the estate now serves as a Cellar Door & restaurant specialising in local produce. The cool climate and low vigour soil induces an extended, gradual ripening period which allows the grapes to develop flavour and colour that translates into elegant wines of distinction. Reliable rainfall in late winter and spring provides a good start to the season giving way to drier ripening months of February, March and April. The grapes are harvested late March to early May. Degree day summation for October to April is 1309 degrees with an average of 1856 hours of sunshine. This makes Orange one of the sunniest cool climate regions in Australia and plays a major role in producing grapes and wine of distinct fruit flavours and colour. Nestled in a hidden valley, with unsurpassed views of Mount Buffalo, the shaley hillside plantings give rise to low yielding vines and wines of intensity and finesse. For winemaker vigneron couple, Eleana Anderson and Bryan Nicholson, the small range of Mayford Wines is the culmination of many years of toil together, which accounts for a large number of lost weekends and fishing opportunities. The creation of limited quantities of handcrafted wines is underpinned by a unique site in the foothills of the Victorian Alps, sensitive vineyard management, traditional winemaking practices and the staunch support of family and friends. Brian McGuigan is recognised as a trailblazer in viticulture, with world class vineyards utilising best viticultural practices. 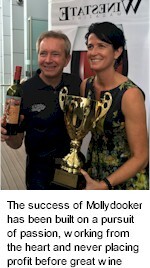 McGuigan was named Australian Wine Company of the Year at the 2003 Winestate Magazine Awards. The Award was given on the strength of McGuigan's wines in extensive tastings run by the magazine during the past 12 months. 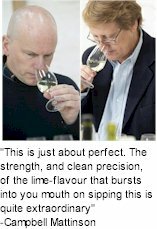 All the tastings are run 'blind', assuring that wine quality is the only measure. 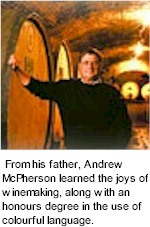 McPherson Wines had its beginnings in 1968. Jock McPherson worked in wineries in the early days of the industry in New South Wales. From him, his son Andrew learned the joys of winemaking, along with an honours degree in the use of colourful language. In 1974 Andrew embarked upon his career, he has spent his entire working life to date in the wine industry. 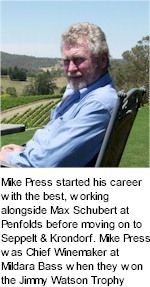 In 1993 he established vineyard holdings in the Murray Darling region near Mildura. 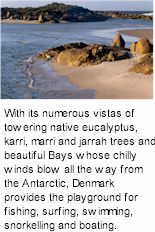 This region principally surrounds the mighty Murray River, the source of much Australian folklore due to its beauty and majesty. One of the most significant grape growing areas in Australia, the region is over 350km wide (east to west) and is renowned for its production of soft, generously flavoured wines. Metala is therefore a great and superlative label, the very first of a long, and proud lineage. The history of the Metala vineyard dates back to 1891 when founder George Formby planted 21 rows of Shiraz and 14 rows of Cabernet Sauvignon on his property on the banks of the Bremer River. Most of those original vines along with a further five acres of Shiraz planted in 1894, still bear fruit with the Shiraz forming the backbone of the extraordinary Metala Original plantings. Internationally acclaimed, highly sought after and perennially emulated, Metala stands as a beacon amongst the great vineyards of the Langhorne Creek. In 1851 the Michelini's began growing grapes and making wine in the Trentino Alto Adige region of the Italian Alps. Emo Michelini arrived in Sydney in 1949 at the age of 25, and two years later with his wife Olga moved to the Buckland Valley where he began share-farming with several other Italian families, growing and curing tobacco. 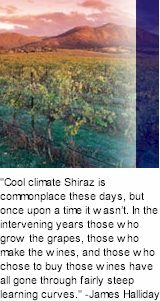 Looking for a source of fruit from cooler climates as blending material for their existing warmer sites, the Barossa based Orlando Wines approached Emo in the early 1980's and discussed the possibility of developing a vineyard in the region. 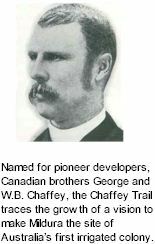 William Benjamin Chaffey (born in 1856 in Brockville, Ontario) was a Canadian engineer who with his brother George, developed the California cities of Etiwanda, Ontario, and Upland, as well as Mildura in Victoria. He established irrigation companies in both Mildura and in Renmark, where he is still held in veneration. His company, Chaffey Brothers Ltd, went into liquidation in 1894. He remained in Mildura, becoming mayor in 1920, establishing an orchard, and the Mildura (later Mildara) Winery Pty Ltd.
Sam grew up amongst the vines in Griffith but he eventually became aware of the quality of King Valley fruit as growers would drop by to sell their harvests. Sam became highly enthused by tales the growers would tell him of the natural beauty of King Valley and the excellent conditions for growing world class fruit. Griffith and King Valley share a vibrant culture of Italian migrant agriculture, in 1991 Sama made the journey and fell in love with the picturesque beauty of Victoria's high country. Sam loved the fresh style and complex structure of King Valley wines. He acquired a 70 hectare property in 1997 on the corner of Snow and Whitfield Roads. 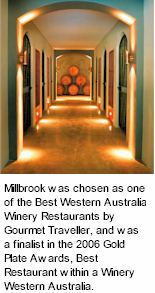 He made his King Valley operations complete when he established a winery and cellar door in the following year. 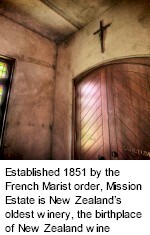 Established 1851 by the French Marist religious order, Mission Estate are New Zealand's oldest winemaking concern under continuous management. A Mission of French clergy sailed to New Zealand in 1838 with little more than their faith and a few vines. The Society of Mary was founded near Lyon in France. With the blessing of the Pope, a group travelled to the Pacific, arriving in New Zealand in 1838. Besides being a teaching order, the Fathers established a mission station near the Ngaruroro River between Napier and Hastings at Pakowhai. They followed the tradition of running a balanced farm property, fruit trees, cattle, and a vineyard. Preece chose an old grazing estate, then known as Blackwood Park, in the Nagambie district in central Victoria for its climate, soil and proximity to the waterways. The site's history stretches back to 1836, when the explorer Major Thomas Mitchell crossed the river on his 900 kilometre journey from Sydney to Melbourne, at a place called Mitchellstown. 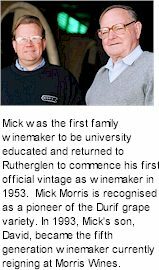 Ross Shelmerdine called his fledgling winery Mitchelton, a derivation of Mitchellstown and the vineyard's first sod was turned in 1969. Don Lewis joined Preece for the fledgling winery's first vintage in 1973, and assumed the winemaker's mantle when Preece retired in 1974. That same year, Mitchelton's winery and spectacular cellar door complex, designed by renowned Australian architect Ted Ashton and complete with 55 metre tower, was officially opened. Moet & Chandon is forever seeking to harness the riches of the unique terroir of Champagne and thus produce truly outstanding wines. In 1927, through the influence of Moet & Chandon, the Champagne vineyard was awarded an Appellation d'Origine, which subsequently became one of the first ever AOCs in 1935. The rolling hills of Italy's Piemonte and the flat plains of Victoria's Goulburn Valley are worlds apart. 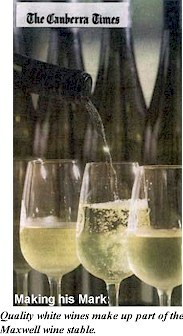 The classic tradition of wine making however, has transferred flawlessly from one hemisphere to the other. 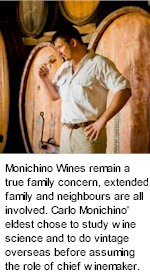 When Carlo Monichino migrated from the Asti region of northern Italy, he brought his winemaking skills with him. 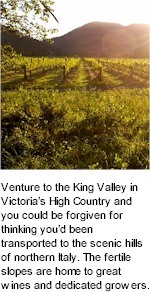 Carlo and Margaret Monichinon established their first vineyard on the Australian continent at Katunga in central Victoia's Goulburn Valley in 1962. The Monichinon family recognized that the rich soil and excellent climatic conditions make this region ideal for grape growing. Vines were first planted here during the 1880s, one of the oldest and most enduring grape growing regions in Australia. He called it Montana, meaning mountain, after its location in the Waitakere Ranges west of Auckland. Thirty years later his two sons used the same name when they founded their wine company and started producing what soon became the trendsetting wines in New Zealand. 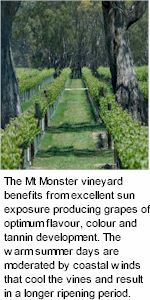 Looking for a greater grape resource, Montana Wines played a key role in the development of Gisborne, on the eastern tip of the North Island, as a premium winemaking region. This coincided with a concerted effort to increase the quality of the wines produced. The pursuit of great wine begins in the meticulous management of the vineyard. Planted on own rootstock in the Padthaway Valley, sited to rich Terra Rosa soils, the vines of this exclusive estate vineyard benefit from excellent sun exposure, yielding grapes of heightened flavour profiles and fine tannins. Morambro Creek Shiraz is an assemblage of select barrels of wines which best demonstrate the intensity of estate grown fruit and integrated oak. Morris Wines, established in 1859, is the continuing story of five generations of family winemakers. George Francis Morris established his vineyard and winery near Rutherglen in North Eastern Victoria. 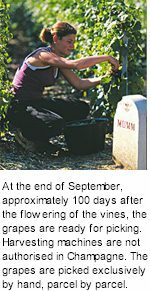 He planted a trial vineyard plot of ten acres at Fairfield two miles east of the current Morris Mia Mia winery location. By 1885 Morris planting's had grown to over 200 acres making them the largest wine producer in the Southern Hemisphere. By the late 1890s the devastating spread of Phyloxera, an aphidlike insect that attacks and kills vines, crippled the Rutherglen district. 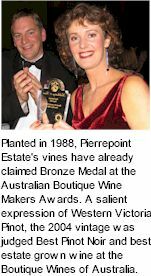 In 1999 they planted vines on the Home Block of the Branson family farm 'Donore', located on the slopes of Mount Burrumboot, on the Mount Camel Range above Colbinabbin. Originally the vineyard was just another diversification of an already diverse farming enterprise of cereals, prime lambs and irrigated clover hay. The first wine was made in 2001 by contract, and 2002 saw the first vintage wine made by Cathy in the machinery shed, surrounded by headers and tractors. The original primitive winemaking operation was eventually refurbished into a new 50 tonne winery in August 2002. Mount Camel Ridge Estate is situated on the eastern face at the cooler, south end of the Mount Camel Range 17km north of Heathcote in Central Victoria. The objective is to produce wine of beauty and finesse that reflects the terroir, the grape variety, the vintage and the site from which they came. Pronounced "Mount Langee Jeeran", the name is Aboriginal for "Home of the Yellow-Tailed Black Cockatoo". The initial vineyards were planted by the Fratin brothers in 1963, on the site of a vineyard that had been in operation at the turn of the century. 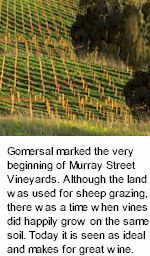 Their first plantings were Shiraz, and initially, the grapes were sold to neighbouring winemakers. The exceptionally high quality of their fruit quickly drew a strong following and encouraged the Fratins to begin making their own wine. The inspiration behind the planting of vines in the Yarra Valley came from Swiss settlers of the 1850’s. These worldly and hard working immigrants had been greatly influenced by French wines and recognised the climatic parallels the Yarra Valley shared with Bordeaux and Burgundy. After extensive visits to the wine producing areas of the world in the late 1960’s, and in particular those of Bordeaux and Burgundy, John and Marli Middleton became fixated on French premium wine. They resolved to find a suitable site upon which to establish a small commercial vineyard with the intention of making elegant, low alcohol wines from French varieties. John was obsessed at this stage with an idea put in his head by Colin Preece of Great Western, that Australia was yet to produce a refined and elegant Cabernet. John saw it as his duty to work towards this. Mt. 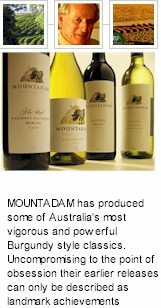 Monster is synonymous with premium wines grown to the Padthaway region being awarded over 80 medals in International and Australian Wine shows in recent years. The vineyards are planted on their own rootstock to some of the world’s oldest mineral rich soils and in the most temperate of maritime climates. The Mt. Monster vineyard consistently produces excellent fruit quality from low yielding vines. Only the best parcels of fruit are carefully selected and utilized for the Mt. Monster label. Great attention to detail is paid, the integration of fruit flavours and fine oak barrels helps produce classic handcrafted wine styles. The wines express full varietal flavours, taking full advantage of the Padthaway’s maritime climate with its long slow ripening season and unique soils. Mount Pierrepoint was named by Major Thomas Mitchell in 1836. Mitchell arrived in Australia in 1827 to become the Surveyor-General of the colony of New South Wales, a position he held for 27 years. He was responsible for the placement of roads, bridges and towns, and as a result of leading four expeditions of exploration, he carried out most of the surveys of Eastern Australia, which lead to new grazing lands being established in southern Victoria. Mitchell named the area after Major Charles Pierrepont who served with the 26th Regiment of Foot and fought in the Napoleonic Wars. Pierrpont was killed in 1812 during the attack on the hornwork at Burgos, Spain. The Griffith-based McWilliam family, already a famous Australian wine company, purchased a half share of the Estate and encouraged O’Shea to continue with his winemaking style and creations. McWilliam’s acquired the remaining share in 1941. It was with the McWilliam family’s financial backing O’Shea selected and purchased the Lovedale and Rosehill properties and planted them in 1946. 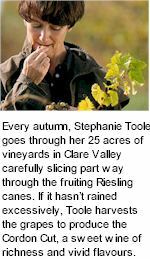 O’Shea’s groundbreaking work has been kept alive by revered winemakers Brian Walsh and Phil Ryan. 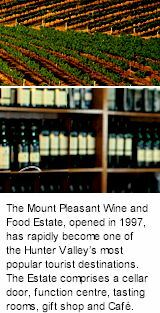 The fact that there have been just three Chief Winemakers at Mount Pleasant since 1921 has ensured consistency of wine style and quality. Inland, the mountains look down on the stony-soiled vineyards of the Wairau Valley. 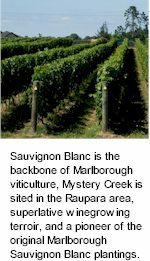 From here, and other famous parts of the Marlborough region, a reputation for outstanding wines has spread around the world. Distinct regional characteristics have been celebrated, since the first plantings in 1973. Mount Riley is the predominant peak in the Richmond Range of mountains that overlooks the Wairau Valley. 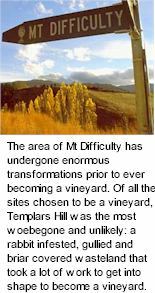 Mt Difficulty owns some of the oldest vineyards and is one of most respected wineries in the Central Otago region of New Zealand's rugged South Island. The joint venture company, founded by some of Central Otago's most devoted and skillful growers, has grown into a leading New Zealand boutique winery with export markets everywhere. From that point, the decision to move to Marlborough and become involved in the wine industry was an easy one. 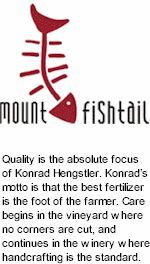 Konrad originally migrated from Germany to Australia, where for twenty years he oversaw the establishment and development, of a large German company's subsidiaries within the Australasia region. Eventually, Konrad felt a calling which inspired him to labour long and hard at the development of his own micro winery in the scenic environs of the Marlborough wine growing district. High above the plains of Marlborough, one can see Mount Fishtail’s peak standing as a sentinel looking over the many quality vineyards. This double peaked mountain is an inspiring omen and became the name of the estate vineyard at Foxes Island in the Wairau Valley. When a glass is raised for the first time, it’s a moment full of promise. Living up to the promise is Mudhouse only ambition. If the first sip makes a good impression, they know they’ve done their job right. If it fails to amuse the palate, the winemaking team make a point of going outside and howling at the moon. But seriously, any connoisseur would agree that winemaking is one of the world’s most responsible tasks. It’s up there with making policy decisions at parliament and deciding a child’s name. As a major player in the world of champagne, Mumm has been instrumental in the success of this outstanding product across the centuries. It has been behind advances in viniculture and high-profile initiatives which have helped establish champagne's international reputation while respecting tradition and keeping pace with changing tastes and fashions. Murray Street vineyards, winery and tasting room are located at Greenock in the western Barossa, a part of the beautiful landscape tapestry of the region. 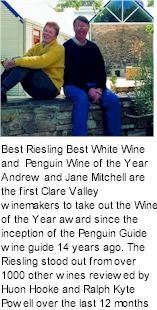 A small team of friends and family, produce wine that conveys the rich viticultural traditions of the Barossa and Shiraz and Shiraz blends, Eden Valley Riesling and forges fresh ground with varieties new to the region and Viognier and Marsanne. 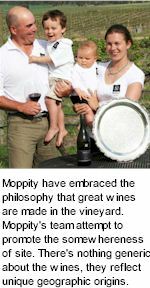 Murray Street Vineyards was established in 2001 by Andrew and Vanessa Seppelt and Bill and Pattie Jahnke, who shared a dream of creating unique artisan wines that would sustainably honour the Barossa's rich winemaking heritage. And they wanted to provide an extraordinary and enriching experience for visitors from around Australia and around the globe. 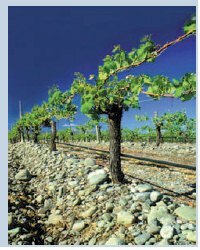 Vines are planted to Horotiu sandy loam over free draining river shingle, sited on a gentle north facing slope overlooking the Waikato River. The original Chardonnay grapes were planted in 1990 and sold on contract. The winery itself was constructed in 1999 and the first vintage harvested in 2000. More recently Pinot Noir, Sauvignon Blanc, Viognier, Cabernet Franc, Merlot and Syrah have been planted with the first harvest produced in 2005.